Honey is probably the most popular bee product available to us. However, bee pollen may just be the most important and oldest superfood on earth! It is actually bee pollen nutrition that is responsible for many of the health benefits of raw honey. Bee pollen also contains a large number of nutrients necessary for the human body to thrive, including minerals, vitamins, enzymes, fatty acids and lipids, and antioxidants like bioflavonoids and carotenoids. Bee pollen contains more amino acids than beef or eggs, and more protein than any animal source. That definitely sounds impressive. In fact, the German Federal Board of Health officially recognizes bee pollen as medicine, not just a food. Bee pollen nutrition may help reduce inflammation, boost immunity, protect the liver, relieve stress and menopausal symptoms, and promote natural healing. This article highlights bee pollen, and everything you need to know about bee pollen benefits. What is bee pollen exactly? The process of gathering pollen is quite complex for honeybees. Pollen is considered the male seed of flowers, and it is needed for fertilization of the plant. Bees will collect pollen from plant anthers, and mix it with small dose of the nectar secretion. It is then placed in specific baskets called corbiculae that are found at the tibia of their hind legs, which are known as pollen loads. After the collection of pollen, the honeybee brings it to the hive where it is packed within honeycomb cells. The pollen surface is then covered with wax and a thin layer of honey to create bee bread. It is the bee bread that serves as protein source for the bee colony. Most of the time bees collect pollen from the same plant, but sometimes pollen is collected from a variety of plant species. That is why the pollen grains will differ in color, size, weight, and shape. Bee pollen color ranges from bright yellow to black. Perhaps the most interesting fact about bee pollen is that it can’t be duplicated in a laboratory. That is because when researchers take away a bee’s pollen-filled comb and feed it manmade pollen instead, the bee dies even though all the known nutrients are in the lab-produced pollen. Some mysterious, unidentifiable elements may be the real reason why bee pollen is so powerful at fighting disease. What are the bee pollen nutrition facts? Bee pollen is considered one of nature’s most complete foods. It contains special bee-made compounds that are used as medicine. The chemical composition of bee pollen comprises approximately 250 substances, including enzymes, vitamins, minerals, lipids and fatty acids, and amino acids. Bee pollen contains about 23% protein, including 10% essential amino acids. It also contains 30% digestible carbohydrates, 26% sugars like glucose and fructose, 5 percent lipids like essential fatty acids, 2 percent phenolic compounds like flavonoids. Its other antioxidant flavonoids include bioflavonoids, carotenoids, quercetin, rutin, myricetin, and trans-cinnamic acid. It is also packed with vitamins such as vitamin A, vitamin C, vitamin E, vitamin D, and B vitamins like folate, vitamin B1, vitamin B2, and vitamin B6. From a mineral perspective, bee pollen also contains some magnesium, calcium, phosphorus, potassium, sodium, zinc, selenium, copper, iron, silicon, sulfur, and manganese. Bee pollen has a long and storied history, and like honey, it was written about in many well-known texts by various historical figures. The early Egyptians described bee pollen as “life giving dust.” Bee pollen is mentioned throughout the Bible, the Torah, the Talmud, the Koran, and also ancient writings of the Romans, Greek, and Orient. The father of Western medicine, Hippocrates, prescribed bee pollen for its health benefits. Native Americans even wore pouches of bee pollen around their necks to provide them with energizing food for long journeys. In China, bee pollen was described over 2,000 years ago for its neutral and sweet taste. Today, China is the world’s largest producer of bee pollen, followed by the U.S.
What are the incredible health benefits of bee pollen? Studies have shown that enzymatic hydrolysates in bee pollen could potentially help treat various diseases like heart diseases, high blood pressure, cancer, and diabetes. Researchers have even suggested that the antioxidant activity of bee pollen is similar to that found in fermented foods like miso and natto. The following are five other reasons to consider using bee pollen on a regular basis. The tonic and nutritional properties in bee pollen make it an effective natural stress reliever that can boost mental capacity, strengthen the nervous system, and improves blood supply to nervous tissue. Bee pollen may also improve performance and physical endurance for athletes. It also improves mood and energy, which is especially useful for the elderly. Bee pollen also relieves stress-related pain or injuries common with athletes or active individuals. The anti-inflammatory properties of bee pollen are comparable to many drugs on the market today, including indomethacin, phenylbutazone, analgin, and naproxen. Research suggests that bee pollen is effective for liver disease or toxicity, degenerative conditions, and chronic or acute inflammatory conditions. A study published in the journal Pharmaceutical Biology in 2010 found that bee pollen displayed significant anti-inflammatory activities when treating acetaminophen-induced liver necrosis in mice. 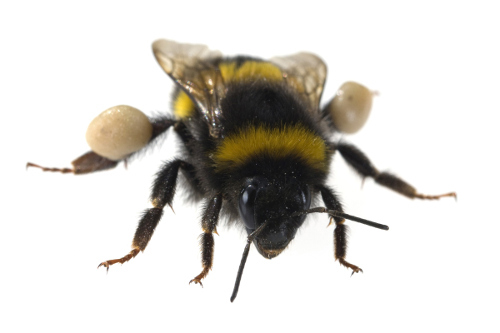 Various animal studies suggest that bee pollen can help animals with nutrient deficiencies. One study published in the Journal of Animal Physiology and Animal Nutrition in 2011 found that bee pollen significantly increased body weight, milk yield, conception rate, and litter size in female rabbits. The bee pollen also increased the growth rate of baby rabbits. Researchers indicated that bee pollen could be helpful for children with developmental delay or lack of appetite. Bee pollen may also help malnourished adults and children, especially when they’re under mental or physical stress, when recovering from alcohol addiction, or before and after surgery. The antiviral and antimicrobial properties of bee pollen are great for the immune system. A study published in the journal Food and Chemical Toxicology in 2014 examined the biological activity of eight commercial bee pollen products from the market, and all samples exhibited antimicrobial effects. Candida glabrata was the most resistance to bee pollen, and Staphylococcus aureus was the most sensitive. Bee pollen may also stimulate the immune system to produce antibodies for elimination of allergies and hay fever. Another study published in the Journal of Medicinal Food in 2008 found that bee pollen’s anti-allergic action is due to its ability to inhibit mast cell activation. Mast cells play a vital role in the early and late stages of an allergic reaction. A study published in the journal Molecular and Clinical Oncology in 2015 found that bee pollen and honey both improved menopausal symptoms in breast cancer patients taking anti-hormonal treatment. Incredibly, more than two-thirds of the patients that finished the study reported an improvement of symptoms. The researchers suggested that bee pollen and honey may help women with postmenopausal symptoms when other alternatives have failed. Also, the flavonoids in bee pollen can also prevent breast cancer, and therefore can support menopausal women with a history of breast cancer. Want to know where to buy bee pollen? This is where it is best to find a local beekeeper or a reputable company that may sell their products at health food stores or the local farmers’ market. You will want bee pollen that is pesticide-free and from chemical-free bee colonies. Bee pollen extract is also common in many natural skincare products. Refrigeration is recommended if you intend to store bee pollen for more than a few weeks after your purchase. Bee pollen is also very versatile, and can be used in a number of ways, especially when it’s ground and mixed with other foods. You can combine ground bee pollen with cottage cheese, yogurt, o honey in a 1:1 to 1:4 ratios. For people fighting allergies, stress, illness, inflammation, or nutritional deficiencies, the bee pollen dosage is about one teaspoon of mixed pollen for three times daily. For bee pollen capsules, you can take 500 milligrams to 1,000 milligrams daily, or as directed by your health practitioner. Bee pollen granules or extracts are also available, and can be added to baked goods, cereal, or yogurt. The granules can also be grounded, and added to salads or smoothies. Also, when bee pollen granules are added to warm water for two to three hours, they release their nutritional value. The liquid can then be enjoyed, or added to smoothies for optimal health benefits of bee pollen. The health benefits of bee pollen nutrition are seemingly endless; however, there are a few things to keep in mind about the product. For starters, it is safe for most people when taken orally for a 30 to 60-day timeframe, but this depends on the bee pollen dosage. Lower doses can be taken with a bee pollen mixture, and are considerably safer. What are potential bee pollen side effects? An allergic reaction to bee pollen is considered the main concern of the product. You should stop using bee pollen and consult your doctor if you notice swelling, lightheadedness, shortness of breath, or itching after taking bee pollen supplementation. There is also some concern that bee pollen may threaten pregnancy by stimulating the uterus. As a result, pregnant women should avoid bee pollen or consult a natural health professional for guidance about the bee product. In summary, bee pollen is a super powerful food with antiviral, antibacterial, and antifungal properties that can potentially reduce inflammation, boost immunity, relieve stress, and much more. Research even suggests that bee pollen can prevent and reverse poor nutrition and malnourishment. Basically, we would be a lot worse off without bee pollen nutrition, and other bee products. “Benefits of Bee Pollen,” The Natural Shopper; http://thenaturalshopper.com/resources/bee-pollen/bee-pollen-benefits-and-history.html, last accessed March 30, 2017. “Bee Pollen History,” Bee Pollen; http://www.beepollen.com.au/history-of-bee-pollen, last accessed March 30, 2017. “Bee Pollen,” Mountain Rose Herbs; https://www.mountainroseherbs.com/products/bee-pollen/profile, last accessed March 30, 2017. “Bee Pollen,” VonnyBee; http://vonnybee.com/useful-stuff/bee-pollen-3/, last accessed March 30, 2017. “The Use of Bee Pollen as a Superfood,” Mercola; http://www.mercola.com/article/diet/bee_pollen.htm, last accessed March 30, 2017. “The effects of Bee Pollen on Energy and Weight Loss,” The Helix12Project; http://www.thehelix12project.org/bee-pollen-history–facts.html, last accessed march 30, 2017. “Bee Pollen Health Benefits Nature’s ‘Fountain of Youth,’” Underground Health Reporter; http://undergroundhealthreporter.com/bee-pollen-health-benefits/, last accessed March 30, 2017.